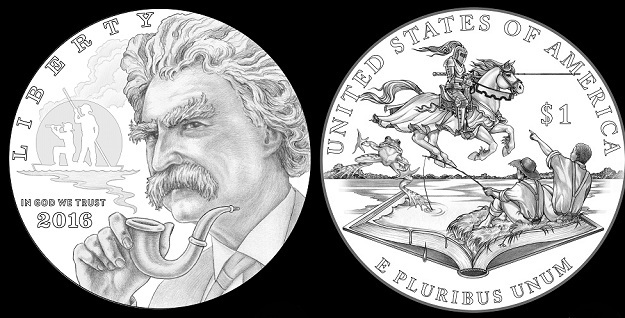 On Saturday, November 28, the U.S. Mint unveiled its design selections for the 2016 Mark Twain Commemorative Coins during a ceremony at the Mark Twain Museum in Hannibal, Missouri. A Mint press release points out that the unveiling took place two days before the 180th anniversary of the author’s birth on Monday, November 30. Pricing and release dates for the coins will be released sometime next year. The obverse and reverse of the $5 gold coin are pictured above. The obverse was designed by Benjamin Sowards, sculpted by Don Everhart, and includes a portrait of Twain with the inscriptions, IN GOD WE TRUST, LIBERTY, and 2016. The reverse was designed by Ronald D. Sanders and sculpted by Joseph Menna. A Mississippi River Steamboat is pictured, with the inscriptions UNITED STATES OF AMERICA, E PLUIRBUS UNUM, and the coin’s $5 denomination. The obverse of the silver dollar was designed by Chris Costello and sculpted by Michael Gaudioso. It bears a portrait of Mark Twain smoking a pipe; the smoke rises to form a silhouette of Huck Finn and Jim rafting the Mississippi River, as depicted in The Adventures of Huckleberry Finn. Inscribed along the left side of the design are LIBERTY, IN GOD WE TRUST, and 2016. The reverse of the coin was designed by Patricia-Lucas Morris and sculpted by Renata Gordon. 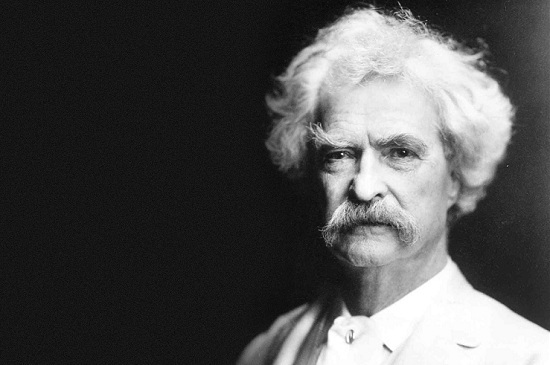 It includes images of characters from a variety of Twain’s works, including The Adventures of Huckleberry Finn, A Connecticut Yankee in King Arthur’s Court, and The Celebrated Jumping Frog of Calaveras County. Inscribed along the rim are UNITED STATES OF AMERICA and E PLURIBUS UNUM, with the coin’s $1 denomination located in the field nearby. The legislation that approved these issues allows for the production of up to 100,000 $5 gold coins and 350,000 silver dollars. For more information on the U.S. Mint’s commemorative coins program, please visit its Web site.